With over 25,000 quotations from over 4,000 sources, The Chambers Dictionary of Great Quotations is the category-leading quotations dictionary. Welcome to a treasure trove of the wittiest, most insightful, most famous and most important words uttered in history. With more quotes than any other quotations dictionary, from more sources, with better international coverage and full author biographies rather than just a brief line, The Chambers Dictionary of Great Quotations is the only book you need. This fully revised 3rd edition presents even more inspiring, reflective, insightful, witty and wise words from across the centuries. With its broad historical scope it is the ideal tool for checking a half-remembered line, finding a telling turn of phrase, or simply browsing the accumulated wit and wisdom of the ages. This edition brings contains thousands of new quotations up to 2015, mixing old favourites and new sources such as Barack Obama, Bradley Wiggins, Kurt Vonnegut, Arsene Wenger, Richard Dawkins, Seamus Heaney, Pope Francis and 50 Cent. This is a browser’s paradise stretching from ancient times to the present day. Entries are arranged alphabetically by author, starting with Diane Abbot’s description of the United Kingdom’s Parliament as ‘a nightmare of elderly white males’ and finishing with Facebook’s Mark Zuckerberg telling us to ‘move fast and break things’. Between those two extremes are just under 1000 pages of quotations, followed by a 350-page keyword index, so you can locate a quote even if you can only remember a single word or phrase. As well as literary quotations from important authors past and present this collection contains quotations from writers, critics, politicians and journalists. We have sought out memorable phrases from scientists, industrialists, entertainers, sportspeople, and many more, to reflect the diversity of modern life. And just as the world has changed since the last edition of this dictionary, so many of the hundreds of new quotations reflect these changes, and important global and local events. 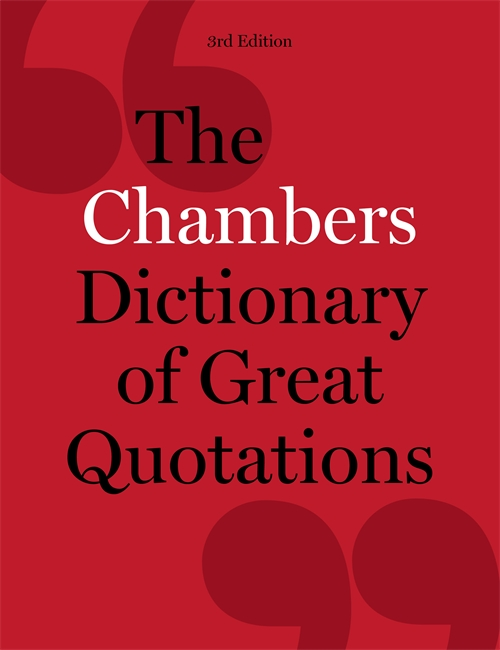 The Chambers Dictionary of Great Quotations includes quotations from over 4,000 sources, including: Jonathan Aitken, Woody Allen, Giorgio Armani, David Beckham, The Bible, Tony Blair, Don Bradman, Robert Burns, George W Bush, Catullus, Bill Clinton, Hillary Clinton, Brian Clough, Jarvis Cocker, Simone de Beauvoir, Charles Dickens, Tracey Emin, E M Forster, Stephen Fry, Joseph Heller, Charlton Heston, John Humphrys, Joan of Arc, Elton John, The Koran, Mao Zedong, George Melly, George Michael, Jo Moore, Andrew Motion, Friedrich Nietzsche, Sylvia Plath, Plato, Will Self, William Shakespeare, Stevie Smith, Kevin Spacey, Quentin Tarantino, Margaret Thatcher, Queen Victoria, Gore Vidal, Oscar Wilde, Michael Winner, Emile Zola and many more. If you’ve ever struggled with a half-remembered line or you’ve got a quote in your head and don’t know where it comes from, this is the book for you.